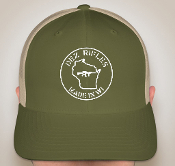 DEZ Rifles - Trucker Hat - Moss/Khaki | DEZ Tactical Arms, Inc. This classic snapback style trucker hat features the DEZ Rifles logo on the front. Moss color hat / khaki color mesh back with white embroidery.